Tartly sweet or sweetly tart? 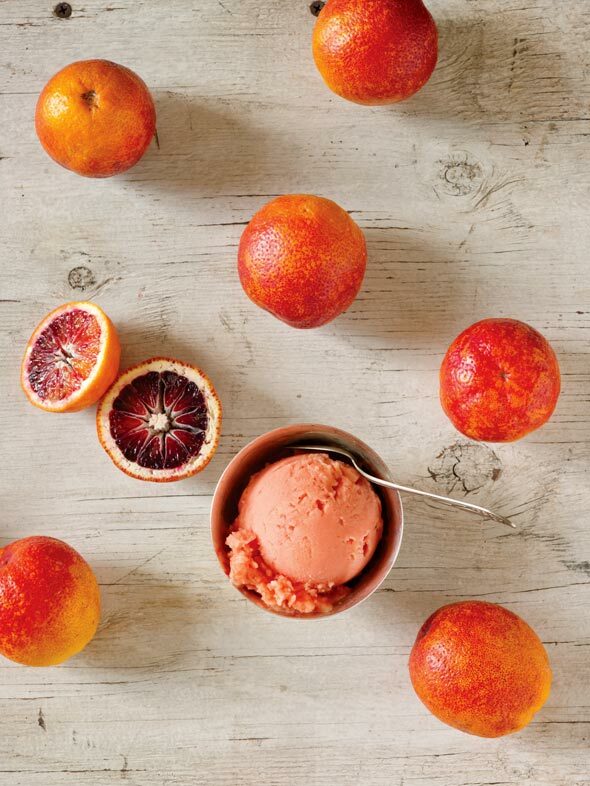 We can’t quite discern which best describes this stunning and simple blood orange sorbet. Not that it matters. What does matter, at least to us, is not just the perfectly balanced taste and the vibrant hue, but the utter versatility of this sorbet. Yes, you can simply scoop it into dishes as dessert or spoon it straight from the freezer container as a midnight nosh. But you can also blitz it with vodka in a blender as a naughty way to get your dose of Vitamin C. And you can divvy it among flutes and top it off with Prosecco as an inspired accompaniment to your morning paper and eggs. Now if you’ll excuse us, we’ve some sorbet to tend to…. 1. To make the blood orange sorbet, combine the water and sugar in a small heavy-bottomed saucepan over medium heat. Bring just to a boil, whisking to dissolve the sugar. (If you prefer a not-so-sweet sorbet, you may wish to add just 3/4 cup sugar for starters, then taste and go from there.) Remove the pan from the heat and whisk in the blood orange juice and lemon juice. Pour the mixture into a shallow pan or bowl and refrigerate until completely chilled, 1 to 2 hours. 2. When the mixture is cold, pour it into an ice cream maker and process according to the manufacturer’s instructions. If a soft sorbet is desired, serve immediately. If a firmer sorbet is desired, transfer the sorbet to an airtight glass or plastic freezer container, cover tightly, and freeze until firm, at least 4 hours. 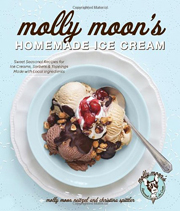 Blood Orange Sorbet Recipe © 2012 Molly Moon Neitzel. Photo © 2012 Kathryn Barnard. All rights reserved. All recipes and photos used with permission of the publisher. The next time the weatherman predicts a blizzard, make sure you have blood oranges on hand to make this deeply citrusy, floral, downright delicious sorbet. You’ll thank me when you’re frozen in your house and you’re able to eat sunshine in a bowl. I got about 8 servings from my batch. That really means that I just got to eat 8 bowls by myself because I was too selfish to share. Inclement weather will do that to you. Love this blood orange sorbet recipe! Couldn’t be simpler. Not too sweet, not too tart. I can see using this same method and ratio with other juices and fruit purees. This blood orange sorbet is perfectly simple. The taste of fresh oranges shines through. The little touch of lemon isn’t detectable because it boosts the orange so well. Even the instructions are perfect and easy to follow, and the timing is spot-on for each step. This is for the sweet-toothed individual, as every bite is 1/3 sugar. This blood orange sorbet recipe is a light, bright dish that feels like a healthy winter indulgence after the excess of the holidays. It couldn’t have been easier to make. Take care with the blood orange juice, though, since it can stain. Here’s the only problem I encountered with this blood orange sorbet recipe—it was far from enough! Please double or triple the recipe as it’s so wonderfully good it will disappear in seconds! Literary. I made it for dessert and the five of us finished it all and were saddened there was no more. The color was beautifully vibrant, the taste refreshing and powerful. Cannot wait to buy more blood oranges and fill my freezer with this amazing sorbet. Whether you’re eating this blood orange sorbet on its own as dessert or serving it between courses as a palate cleanser, this recipe delivers a wonderful sorbet. It wasn’t too sweet or too tangy but just right, and the texture after freezing was quite smooth. It’ll be good to have a stash of this in the freezer. I’m sure I can whip up some wonderful frozen cocktails with this as well. This blood orange sorbet recipe makes a very nice sorbet, full of bright fresh orange flavor. And it’s easy to make. The hardest part was waiting for it to firm a few hours in the freezer. The amount of sugar used seems a bit much for a juice that tends to be as sweet as orange. The resulting sorbet, although refreshing, is very sweet—almost too sweet for some of my tasters. The end result is a sorbet that I’ll make again, as I love the taste of blood oranges, but perhaps I’ll reduce the amount of sugar I use to 3/4 cup so it’s a little more tart. So refreshing and so easy—if you can find the blood oranges, which were right up front and beckoning to me at my favorite store. I froze the sorbet in two containers and it took less than 15 minutes to get to the right consistency. It did need two containers, though; I think if I’d used just one my ice cream maker would’ve been overloaded. This blood orange sorbet is so delicious: it has the perfect balance of sweetness with the hint of lemon. This sorbet just fell into my lap, so to speak; it really was a fine time to try this, as finally my blood orange tree was pretty much ready to harvest. And even the lemons were from my uncle’s Meyer lemon tree. So this was inexpensive, super fresh, and, with the help of a juicer, a snap to make. I made it in a large pan in the freezer like an ice or granita instead of using an ice cream maker. I’ll make this as long as the blood oranges hold out. I served it as a finale after a dinner of duck breast, purée of celery root, and fresh green beans. Mmmm, with a slice of warm gingerbread. I like your thinking, Penny. Hmm, I may have to try this next year when the blood oranges are ripe again. I’ve made a Meyer lemon ice cream (with and without dewberry sauce) that is sunshine in a bowl that will put you over the moon. Would be nice to have a choice between it and the blood orange sorbet waiting for me in the freezer! Thanks for this new idea. You are most welcome, Laura. Thanks for adding this recipe to your “to-do” list! Since I don’t have an ice cream maker, can I use a food processor or a heavy duty blender (I have a Breville)? Oops! I just noticed that you mention a blender in the LC notes. Not a problem, Rosie. Let us know if we can be of help! This will be made. I’m over wishing I had blood oranges all the time; I’m buying out Whole Foods and hoarding them all year. I so want this now!